Deja vu? Almost. More Mother's Day cards and more based on a Kristina Werner Finally Friday video. These are based on this week's video available at Two Peas in a Bucket or at Kristina's blog (link on the right side of the screen). The challenge was to use her card as a starting point. When I started pulling out supplies, I planned to stay pretty close to her original card. Yet, the second card is barely the same as the model card at all. The string on the first card is some thick DMC thread bought on a sale bin at Hobby Lobby. Don't overlook the sale bins in the fabric and regular craft sections for goodies you can use in your papercrafts. This stuff had probably been marked down because it was a varigated color. Yet when you use it on a card, you can't tell it is multiple shades of beige. 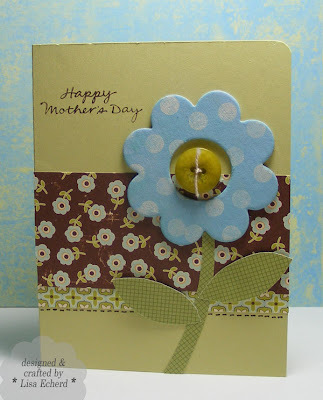 The second card uses a chipboard flower I painted. I didn't have the right color paint so I painted it in a light blue and then sponged Aqua Mist ink from PTI over the top to get close to the color of the DSP's flowers. I tried Kristina's idea of writing my message around my flower. As usual, I hated my handwriting so I just moved the flower up to cover my writing and stamped an image instead. Sometimes I can write something passable but mostly I'd rather just stamp or print my greetings. I was pleased with my freehand cut stem and leaves; didn't even fire up the Cricut. These Mother's Day cards will be going in my Operation Write Home box. The deadline for Mother's Day is April 1 to give time for the troops to receive the cards, make the selections and send them home to their Mother's in May. For more info on sending your cards --> http://www.operationwritehome.org/ Think about how happy all these Mothers will be to receive a card from their son or daughter overseas. Happy day! DSP: Farm Fresh from October Afternoon and a little bit of Old Olive from SU! 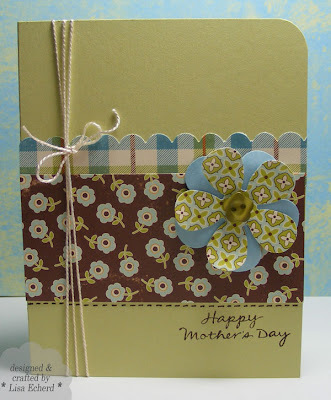 I luv this card, gorgeous patterned paper...have a wonderful week...I am offering a blog give away, check it out! Both are lovely! I really like the layout of the first one! What a great CAS card. Love the colors and your wonderful DP makes everything pop!